'This book will be a lasting treasure for students, professionals and artists in the field of radio and sound programme making. It is a brilliant and masterful achievement.' 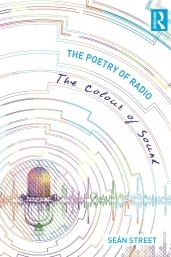 Tim Crook, of Goldsmith's College, University of London, on The Poetry of Radio - The Colour of Sound, published by Routledge on 3 February 2012. Street's new book explores the imaginative connections between Radio and Poetry. Starting from the standpoint of how poets have used sound since before the printed word, the book explores how sonic communication moves beyond speech, providing narrative through the music of the world that surrounds us. Drawing on his own experience of over 40 years of programme making, and with contributions from some of the world's greatest producers and sound artists, including Chris Brookes, Edwin Brys, Kaye Mortley, Piers Plowright and Hildegard Westerkamp among many others, the book promises to provide both historical and international insights into radio as a poetic medium.